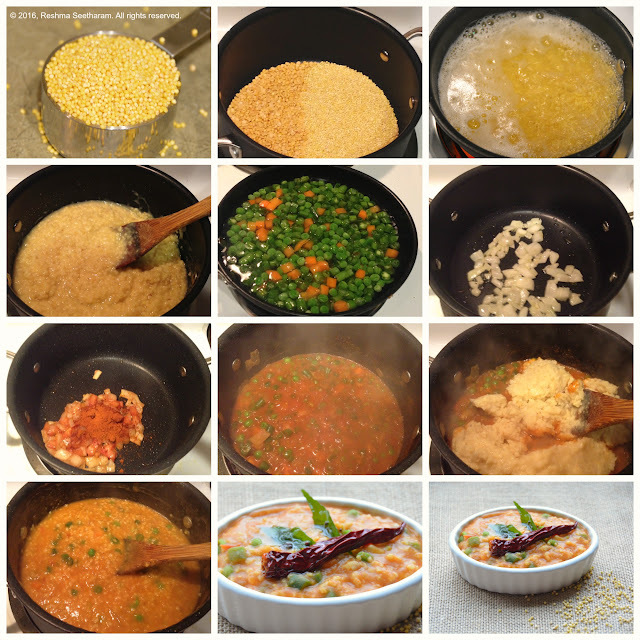 Here is a twist on our classic, yummy bisi bele bath! Swap out rice with whole millets of your choice. For the roasted seasoning: A few peanuts, cashew nuts, curry leaves, 1/2 tsp mustard seeds, 1/2 tsp cumin seeds and 4­ to 6 whole dry red chilies, all roasted in a dollop of ghee. 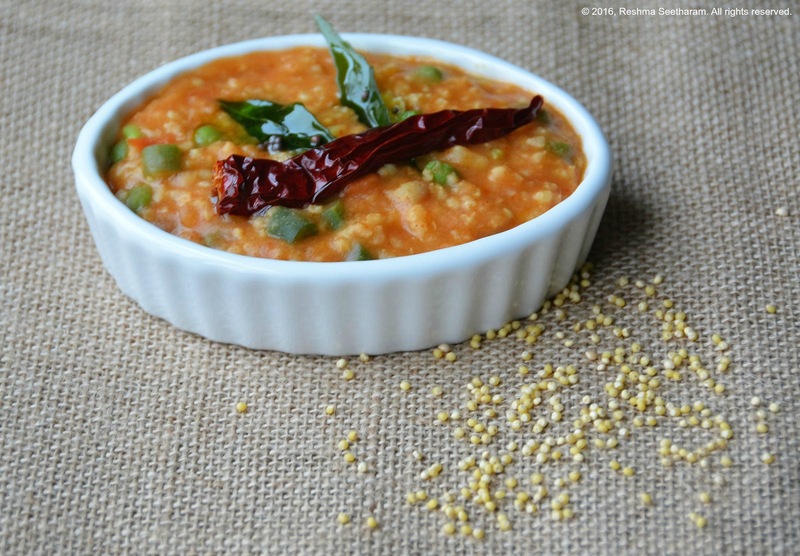 Soak the dal and millets in lukewarm water, for 30 minutes. Drain, pour it into a cooker and cook it completely in 5 cups of water and a little salt. Parallely, boil the peas, beans and carrot with a little salt in a microwave on another stove top pan. Cook them till they are 75% done. Don't cook them all the way. In a thick bottom, large pan, add 1 tsp of ghee. On medium heat, when the ghee starts to shimmer, add in raw peanuts and cashew nuts. Roast to a golden brown. Add in the red chilies and curry leaves. When they roast to a crunchy texture, strain it out and keep aside. In the same pan, to the remaining ghee, add mustard and cumin seeds, let it splatter on medium heat. Add in onions and roast to a light brown. Now add the chopped tomatoes and cook until it is soft and pulpy. Add in the BBB powder, hing, salt and brown sugar. Cook on low heat for 2 minutes. Add the tamarind paste and a cup of water. Bring it to a simmer on medium heat. When the ghee begins to leave the sides of the pan, the masala is ready. Add the cooked dal millets, and vegetables to this masala and stir it very gently. Blend all of it until you see a uniform colored porridge. Let it simmer on low heat. Check for salt, sugar, spice, tanginess. Add in a cup of hot water, if it is too thick. To finish it all, smear a top coat of 1 tsp ghee. Just before the dish is served, garnish it with the roasted peanuts mixture. It goes great with chips or an onion yogurt salad. Enjoy!